Summary: Cinder, the cyborg mechanic, returns in the second thrilling installment of the bestselling Lunar Chronicles. She’s trying to break out of prison—even though if she succeeds, she’ll be the Commonwealth’s most wanted fugitive. Halfway around the world, Scarlet Benoit’s grandmother is missing. It turns out there are many things Scarlet doesn’t know about her grandmother or the grave danger she has lived in her whole life. When Scarlet encounters Wolf, a street fighter who may have information as to her grandmother’s whereabouts, she is loath to trust this stranger, but is inexplicably drawn to him, and he to her. As Scarlet and Wolf unravel one mystery, they encounter another when they meet Cinder. Now, all of them must stay one step ahead of the vicious Lunar Queen Levana, who will do anything for the handsome Prince Kai to become her husband, her king, her prisoner [x]. Review: It was interesting seeing the Cinder and Scarlet storyline tie in with one another. What was not interesting was all this instalove that is happening in the series. If you think about it between these two stories only like 2 weeks has gone by. I think I liked Scarlet’s character better than Cinder. I definitely liked how more was packed into this one. I understand that Cinder was more about world building which is why it probably dragged but I am very happy that it picked up. And very happy that there was a lot more action! My only issue with Scarlet (the character not the book itself) was that you didn’t really get an insight into her at all. You only witnessed how she was always concerned about her grandmother and Wolf. And she’s not judgemental about people who are different (cyborgs & enhanced wolves) I’m hoping that there is more insight in Cress. A good quick read. Can’t wait to read Cress. 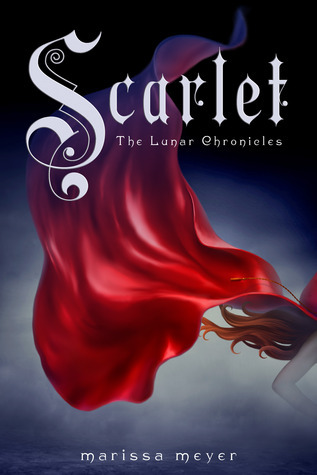 This entry was posted in book, book review, book reviews, books, lunar chronicles, marissa meyer, review, scarlet. Bookmark the permalink.